Confabb is a new service launching today that offers a centralized place to find information about all kinds of conferences. The site offers everything from speaker and event reviews to photos of the events after the fact through integration with Flickr. It’s an impressive full service site that could become the go-to spot for at least tech conference attendees and possibly a wider audience. Confabb is lead by former PubSub co-founder Salim Ismail, product manager Cameron Barrett (who incidentally built campaign web sites for Wesley Clark and John Kerry) and former AT&T exec and PubSub team member Jon Mandell. Early investors include chronic conference attendee and web innovator Dave Winer. At launch the site includes details on more than 16,000 conferences and anyone can fill out a form to submit other events for consideration. 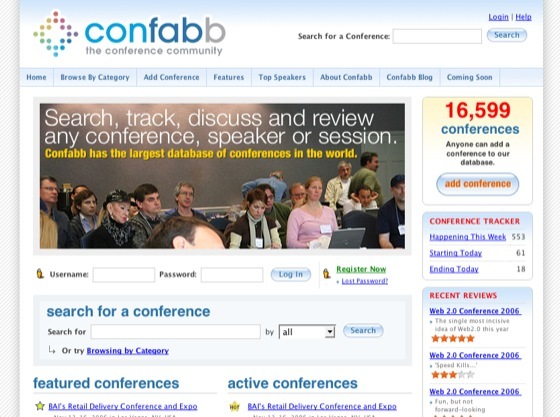 Confabb calls itself the largest conference database in the world. It’s a very well put together site; there are both standard categories and tags, integration of off-site resources, reputation management, user watch pages to track a number of events, a badge generator to post conference logos on your blog and iCal export of your conference list. Attendees and watchers can list themselves for public display. Confabb plans on rolling out a number of new features over the next two to three months, including integration with more calendar programs, video and podcast listings, web based chat rooms per conference and per session and both native and integrated RSVP capabilities. It’s an ambitious road map, but most of these features look like tech industry best practices brought together into one place at a time when at least our sector is finally widely familiar with them. Will Confabb be able to gain traction outside the Web 2.0 world? If attendees of events like the All Asian Food Expo and the Second International Doris Lessing Conference start using Confabb then the events world could really be shaken up. Building use of the system outside the community most prepared for it will take a concerted effort and probably some changes to suit the cultures of other conference communities. There are a few technical things that Confabb could still use. RSS feeds for events by categories are needed badly. Microformats are being considered, the company says, and would help demonstrate that Confabb is a community participant more than trying to be an exclusive destination site. The integration with off site resources is great, I’d like to see Mary Hodder’s Speakers Wiki, a wiki intended to help diversify conference speaker lists, drawn from as well. Map and attendee tag features as was explored by the service Attendr could be interesting too. It’s high time someone took the best practices from across the web that conference attendees and support sites have been developing. It’s great that Confabb is bringing many different services together and aggregating them. The project should get a lot of support and I expect that at least the web world, if not the larger conference world, will be using Confabb quite a bit.